Smartwatches are a great at letting you quickly glance at information, letting you leave your phone in your pocket when you don't truly need it. However, sometimes smartwatches just aren't as good for certain things – like navigation. OnTracks' dual smartwatches, the GuideWatches, available on Indiegogo now for $137, are an attempt to solve that. You wear one GuideWatch on each wrist, and each one vibrates to tell you which direction to turn. When you look at your watch face, you'll see one of seven directions to face. They include left and right turns, slight left and right turns, strong left and right turns and a u-turn. A u-shaped light will also light up when it's time to make your turn. In addition to navigation, the GuideWatches monitor heart rate, GPS, speed and pace, elevation, notifications, and step tracking. There are three main modes: navigation, tracking and daily smartwatch mode. Philippe Leca, CEO of onTracks, told Wareable that you can use the companion app to choose your route, which you can create yourself or use ones created by the community. You can also import routes in GPX and KML. Or you can just search for a location on the map in the companion app and get directions there, as you would with Google Maps. Once you do that, you just press go on the companion app and rely on your dual smartwatches. 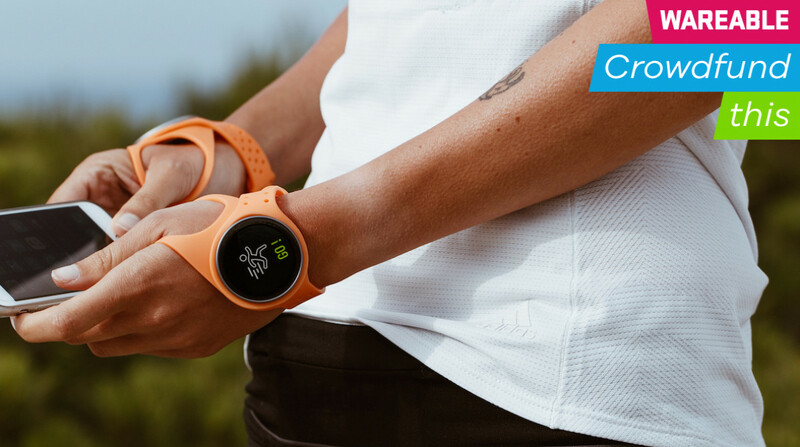 The smartwatches can be worn in two ways: the traditional watch strap, or a sports band that places the watch on the back of your hand rather than on your wrists. The back of hand placement is supposed to make it easier to check your progress and navigation as you're moving about. Leca says the company is also working on gloves for cyclists and motorcycle riders, so that you can simply slot your GuideWatches into the gloves. But why would you wear two smartwatches? Leca says the idea started when he was exploring Calanques National Park near Marseille, France. He had to take out his phone every intersection to check where to go and got tired of it, so he started his own company to make devices that work for him. He argues that two smartwatches are ideal for navigation because your brain has to do less thinking. For instance, the Apple Watch will vibrate 12 times when it's time to turn right and three bursts of two vibrations when it's time to turn left. Your brain has to decipher what those taps mean, Leca says. With the GuideWatches, your left smartwatch vibrates when you need to turn left and the right smartwatch vibrates when you need to turn right. It's kind of like getting tapped on the right shoulder and your head instantly turning to the right to see what's up. Still, wearing two smartwatches is a big ask. It's hard enough to convince people to wear a single smartwatch, let alone two. Unless you're huge on navigation and exploration in cities and don't mind the potential social shame of rocking a watch on each wrist. How shall we navigate this question? Let's say you're big on wearable navigation, and your Apple Watch or Wear OS smartwatch just hasn't cut it on your nature hikes or travel trips. The GuideWatches are definitely for you. Leca says the company isn't setting out to send people to Mars or anything crazy, it's just making two smartwatches with a focus on navigation. Thus, he believes the company's goals are attainable. He also was a director of finance for a company before starting onTracks, which means the company has enough money to complete the production of the devices. Additionally, Leca says major French investors have put plenty of money into the company. The crowdfunding campaign is largely an attempt to build a community of people to create and share routes in the companion app before the GuideWatches are ready for a full release. OnTracks also want feedback on features and things it might have missed. However, he also admits that the company has a lot of work ahead of it. It's received a prototype every month since working on the project, but he's confident it can meet its production goal, which is before Christmas. It's worth remembering that making hardware is extremely hard, and even good preparation and transparency can be derailed by the smallest production problems. Still, onTracks looks to be satisfying a niche for explorers who value navigation on the go. If you aren't satisfied with the current status of navigation on smartwatches and you're willing to take a risk, the GuideWatches could be for you.